1. Learn simple solutions to improve safety plans for operations on and around water. 2. Understand the man overboard’s perspective and effects of wearing PPE in water. 3. 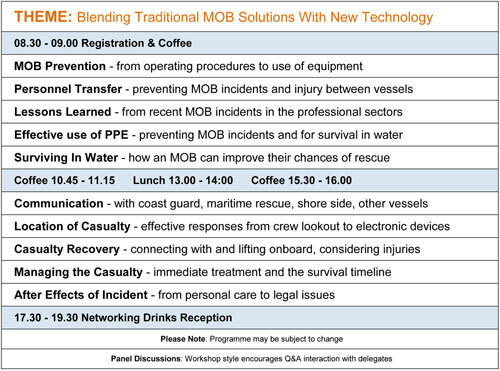 Clarify why rapid return to the MOB plus effective recovery onboard saves lives. 4. Learn how vessel design can influence recovery and lifting of a live casualty. 5. Consider what electronic devices are effective aids to location for an MOB. 6. Discover why new technology still needs Mark One Eyeball in a rescue situation. 7. Gain knowledge of how rescues are coordinated remotely and in area of the MOB. 8. Consider responsibility & liability for organisation & individual from MOB incident. 9. Join industry group sharing experiences and identifying genuine best practice. 10. Learn why a joined up approach to casualty recovery and critical care is essential. NEXT GEN specialist events provide an independent platform where maritime organisations address relevant issues and share knowledge between sectors. The objective is to bring together people with genuine experience to share knowledge and endeavour to improve best practice across all maritime sectors. 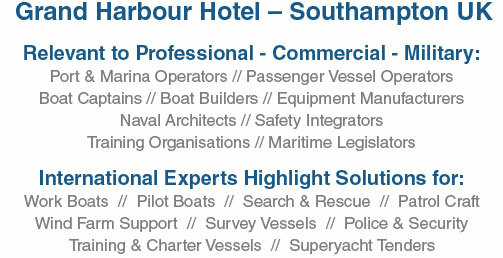 Support has been excellent from both end-user organisations and the marine industry.